Bharatpur is a small town yet it is among the most sought after destinations of Rajasthan Tourism. The historic importance as well as speckled natural beauty makes this place a fascinating destination which enthral tourists during their Bharatpur Tour. The star attraction of this place is Keoladeo Ghana National Park or Bharatpur Bird Sanctuary. This is one of the best bird sanctuaries in the world which make it an Ornithologist's Paradise. Bharatpur known as the ‘Eastern Gateway to Rajasthan’ was founded by the Maharja Suraj Mal in 1733 AD. The historical remnants of this place display the glory of audacious rulers who ruled this mystic place. Keoladeo Ghana National Park is one of the India’s premier wildlife sanctuaries situated at the border between the states of Rajasthan and Uttar Pradesh. The vast geographical expanse, diverse topography and weather together make it a wildlife haven. The sanctuary is a marshy area, stretching over 29 sq km of kadam forests, grasslands and shallow lakes. This national park was created by the Maharaja of Bharatpur in the 19th century by diverting water from an irrigation canal. 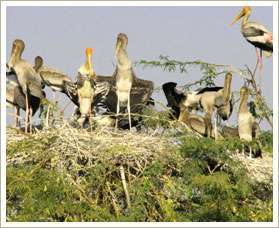 Keoladeo was founded as a shooting preserve, but became a bird sanctuary in 1956. This national park is the home of over 350 species of birds and over 35 species of butterflies. In 1982 it became a national park and today it ranks as one of the best water birds preserves in the world. It is also a World Heritage Site which harbors some of India’s richest species of birds which includes pink tinted painted stork, pelicans, cranes, ducks, eagles, flycatchers, buntings, larks, shanks, painted storks, pipits, white ibis, cormorants, egrets, pelicans, ibises, cranes, ducks, geese Hawks, Pipits, Warblers, Wheatears, Wagtails and many more. But the greatest attraction of Bharatpur Bird Sanctuary is undoubtedly the world-renowned Siberian Cranes who spend their winters here, which is the only second habitat for them in the world. Bharatpur Bird Sanctuary is also the home of exotic flora species of 64 families, 181 genera and 227 subspecies. Besides this tourist here can also spot a wide variety of wild animals which includes Sambar, Chital, Chinkara, three types of wildcat- the Jungle cat, Leopard cat and Fishing cat, Blackbuck, Nilgai and wild boar. Bharatpur Wildlife Sanctuary is open throughout the year. Still the ideal visiting months are from August to November for resident breeding birds and October to February for migrant birds including the world-renowned Siberian Cranes. By Air: The nearest airport is situated at Agra, which is 56-kms from Bharatpur. major cities of India including Delhi, Jaipur, Mumbai and Agra. By Road: Bharatpur is well connected by roads to all the major cities of the Rajasthan and its neighboring states like Delhi, Uttar Pradesh and Haryana. Bharatpur has any number of hotel and private lodges. Santi Kutir and ITDC Forest Lodge are inside the park. Popular places where tourists can stay during their Bharatpur tour are Wilderness Camp, Pelican, Hotel Sunbird and Birder's Inn.